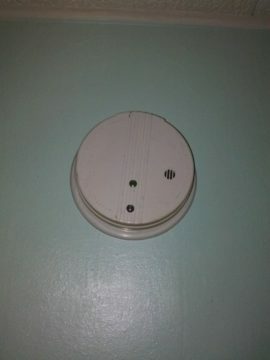 Most homes that have been recently built or remodeled will have “interlinked” smoke detectors. This means when one detector is activated the other devices will also go into alarm. This is by design so if one of a the units detects smoke it will alert the entire dwelling to alert everyone to evacuate and to prevent loss of life. If one of the smoke detectors begins to periodically chirp this is an indication that the the battery needs to be replaced. These are normally 9v batteries but some models may vary. Even “hardwired” or 120 volt units utilize a battery as a back up in the event of power loss the devices will continue to function. Replace the battery as needee. If the unit continues to chirp after a new battery has been installed, firat verify the battery is installed securely, and if that doesn’t solve the problem then give us a call.